One of the best known editors in equine publishing, AJ Mangum opens up about life beyond Western Horseman , balancing his love of horses with his role as a journalist and the inspiring experiences he’s had along the way. HMH: You’ve been around horses all your life, you graduated with a degree in journalism from Oregon State University and you have over twenty years of experience in the equine publishing industry- was there a magic moment somewhere along the way that helped you bring your love of horses and journalism together? AJ: "I grew up outside of a small central Oregon town where it was a bit of a novelty for anyone to go to college, so I wasn’t terribly close to anyone who had successfully navigated the culture shock of college or the transition from academics to the start of a career. And, having grown up working on my family’s horse and cattle ranch, the idea of working for someone else in a foreign, non-ranch environment was a little daunting. After I graduated from college, I moved to Colorado’s Western Slope and for a while, I was at a loss as to what to do next. There seemed to be no job opportunities whatsoever. It reached a point where I just couldn’t imagine the circumstances that could lead to employment. I can remember stuffing 200 outbound resumes into the mail slot at the Delta, Colorado, post office, figuring that, if nothing else, the laws of probability would begin working in my favor at some point. I heard back from, I think, a total of five newspapers. Four took the time to say they had no openings, one offered an interview that led to a job. So I spent about two months as a reporter and sportswriter for a small daily in Alamosa, Colorado, while I still had all these resumes floating throughout the West. The grind of a daily newspaper wasn’t really for me. Every day seemed like a mad scramble, even in a small town with not a lot happening. I wanted to be at a magazine, where I thought I’d have much more time to spend on each story and more creative freedom when it came to how to handle a story. Fortunately, I came home one night and there was a message from the editor of the Appaloosa Journal, the Appaloosa Horse Club’s breed magazine. She’d received my resume and wanted to talk about an opening they had for an associate editor. That was when everything in my background: horses, ranching, writing, began to come together. That’s around 20 years ago now." HMH: Looking back over the past twenty years in the industry, what were your most special highlights? AJ: "I’m reaching a point where I have to refer to my portfolio to jog my memory. Two years into my stint at the Appaloosa Journal, after I’d been promoted to editor, I spent a little over two weeks traveling on assignment in Europe, interviewing breeders in the Netherlands, Belgium and France, and covering a European championship show outside Paris. Growing up, I traveled regionally to compete in horse shows and might’ve made it out of the state once a year for one thing or another, but I’d always hoped to see the world. That excursion to Europe reawakened that ambition and my wife and I have been fortunate enough to make international travel; particularly to the UK, a priority in our lives. I’d say it’s as important to us as our horses are. While I was at the Quarter Horse Journal, I had an opportunity to interview a literary hero, the novelist Thomas McGuane, at his ranch in Montana. When I interviewed for a field editor’s position at the QHJ, the magazine’s editor, Lesli Groves, gave me a copy of McGuane’s novel Nothing But Blue Skies. I figured I’d better make an effort at reading it for fear it would come up in conversation at some point. I absolutely devoured it on the flight home from Texas to Washington, where I was living at the time. McGuane has a writing style that’s polished and lyrical but still natural, even conversational, and his knack for depicting “heartbroken humor” and the ways in which people create their own worst-case scenarios is addictive. I also appreciated the fact there was such a thing as a contemporary novelist who saw the West that I knew as a suitable setting for serious literary efforts. Anyway, McGuane’s a major figure in cutting-horse circles, so we visited about his horses, his ranch and how that world works its way into his fiction. I’m still a major fan of his work. By a weird coincidence, I recently interviewed his son, Thomas McGuane IV, a world-class custom knife maker. 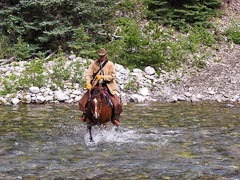 In my early years with Western Horseman, I interviewed Ian Tyson at his ranch in Alberta [Canada] and profiled him in a feature-length story. More than a decade later, I ‘opened for him’ at the National Cowboy Poetry Gathering in Elko, presenting him with an award from the magazine. I’d rehearsed my two-minute speech for the duration of the long drive from Salt Lake to Elko. I hit the stage and promptly forgot every word but it was still a neat moment. Back in 1999, I received a call from a fellow named Don Bellamy, who told me about a show being held that fall at the National Cowboy Museum in Oklahoma City. It was the first Traditional Cowboy Arts Association show. It was arguably the first of its kind, emphasizing the value of traditional handcrafted saddles, bits, spurs and rawhide as collectible fine art; functional fine art. No one knew what to expect from the show, so it was a tough sell for the group to get media attention. I covered that first show for Western Horseman and was apparently the only member of the media on hand. In addition to having an incredible experience at the event, I made a set of lasting friendships with the various TCAA members, some truly special people. Of course, TCAA and their show became major successes and now command a great deal of media attention. I feel honored to have been there as a witness to their beginnings. There’ve been quite a few epic horseback adventures I’ve really enjoyed: a weeklong, 100-mile trek along the most remote stretches of the Idaho-Montana state line, a mountain-lion-tracking excursion with photographer Jay Dusard along the U.S., Mexico border and forays in the backcountry and ranch lands of Alberta’s Kananaskis region. When you’re horseback in this line of work, it’s always special. More recently after my departure from Western Horseman at the end of 2010, I teamed up with Bill Reynolds, one of the Western publishing world’s most innovative figures, on the launch of Ranch & Reata, a multi-platform ‘new media’ publication that we think can rewrite the rules of publishing in our genre. Overall though, there have been more highlights than I can recount, moments when I’m somewhere out in the world, visiting with interesting people with unique stories and I suddenly realize how lucky I am to be doing this." 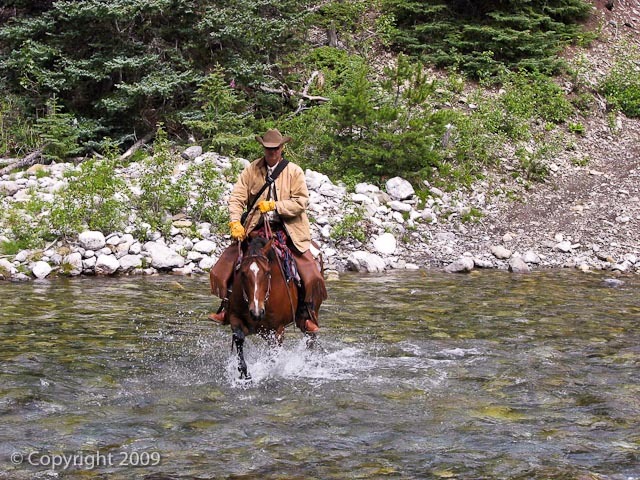 HMH: You’ve traveled extensively throughout the US and Canada, written hundreds of articles and met thousands of people during your nearly ten years as editor of Western Horseman; you must have seen a lot of interesting things take place between horses and people- what really fascinates you about the horse-human relationship? AJ: "Horses can be metaphors for so much in life. If you pay attention to the ways good horse handlers work (and for that matter, the ways in which bad horse handlers work) and get a little introspective about your own interactions with horses, it can be shockingly revelatory. Horses can tell us a lot about the ways in which we learn and teach, about how we approach relationships, set goals, handle setbacks. When you watch or ride with someone who really understands the power in the horse-human dynamic; someone like Buck Brannaman or the late Ray Hunt or one of their proteges, it’s something special, a philosophy all its own. I hope the horses get as much out of it as we do." HMH: What was the the strangest thing you ever saw happen? What really touched you? AJ: "I don’t know that there’s been anything I’d characterize as ‘strange’, at least not in the context of stories I’ve pursued. As is often the case in life, most of the strangeness I’ve witnessed has its roots in the oddities of human behavior. The horse industry offers up an eclectic mix of personalities; both positive and negative. Coping with and trying to manage those more difficult personalities can certainly lead to very strange times and a long repertoire of stories to tell over a drink or two. A former colleague and I used to joke that working at a horse magazine had all the ingredients for a very dark sitcom. More importantly … This might relate more to your previous question about horse-human relationships, but I’ve been close to several situations in which I was touched by how much horses had changed for the better the lives of people who desperately needed help. One of my early stories for the Appaloosa Journal was on the Colorado Boys Ranch, a residential treatment center for kids that get lumped under the umbrella term troubled youth. I can recall interviewing a teenage kid who’d more or less been abandoned by his family. He had a history of acting out, setting fires, he would’ve likely ended up in prison had it not been for an aged mare he’d bonded with during his time at the ranch. This kid had been the sort that just can’t get along in society but learning to ride this mare, learning to take care of her and knowing that she depended on him completely changed his identity. It meant more than any number of world championships could’ve. Nearly two decades later, I encountered a group of veterans suffering from severe post-traumatic stress disorder. They were incorporating groundwork with horses into their psychotherapy sessions. None had any real background with horses and their therapy dictated that they get no help with basics like catching a horse or putting on a halter. They just had to figure it out and deal with any frustrations. Whether something would go right or wrong, a therapist would encourage them to look for metaphors; how their experiences dealing with horses compared to their experiences dealing with people. The program and its horses literally saved the lives of some of these veterans. Horse-human interactions are more powerful than we often realize." HMH: I find that the greatest challenge for journalists in the equine industry is in our role as technical information conduit between truly talented professional horse people and the general public- would you agree? If so, then how can we improve this relationship? AJ: "When you think about the challenge of presenting to readers information on horsemanship, it’s a wonder it gets done at all. You have to boil down a topic to something palatable, something that can be understood in print. You have to have on board an expert source, one that’s both knowledgable and credible, which aren’t necessarily the same thing. It helps immensely if the source is coming at [the subject] from the right place and isn’t looking at the project as nothing more than a marketing opportunity. Then you have to translate into text highly subjective information about specific moments and specific pressures that really must be experienced firsthand to be fully understood. I mean, how do you effectively get across to a reader the concept of feel? Because this is such a daunting challenge, I think a lot of horse magazines default to formulas and formats drawn from the mainstream magazine world: lists, quizzes, step-by-step pieces that get overly simplistic and end up creating unrealistic expectations. When it comes to getting across points about horsemanship, I’m becoming less and less convinced these approaches are all that effective or even all that honest. Their only real strength is that they’re marketable on a magazine cover. I think we have to recognize that horsemanship is an art and not a science. Every horse is different, every rider is different, every ride can be different. Having the same expectations for every horse in every circumstance, or expecting the same result every time a particular set of steps is followed … it’s not as realistic as editors like to pretend. I think information needs to be packaged with more respect for that art of horsemanship. Rather than always offering written-in-rock, step-by-step guidelines, magazines might do well to emphasize thoughtful commentary that equips readers with the mindset they’ll need to deal with the endless contingencies that can occur with horses. That’s an infinitely more difficult story to market on a cover, though. It’s much easier to hype a ‘simple, 5-step plan to improve every ride’, no matter how laughable that premise might be." HMH: It was exciting for me as a freelance writer to spend a day with you and the Western Horseman staff back in 2003 at the magazine’s historic headquarters in Colorado Springs, there was so much history in that wonderful building, it must have been very painful to see it closed down in 2010, and the magazine’s operations moved to Fort Worth, Texas. AJ: "When Western Horseman transitioned from being employee-owned, to being part of a major media company, there wasn’t room on any spreadsheet to quantify sentimentality or heritage. The closure of the magazine’s Colorado Springs headquarters was a slow-moving freight train everyone on the Colorado staff saw coming a decade before it hit. The thing about the Colorado Springs building, and people needed to have spent time there to understand this, is that it wasn’t just an office building or another corporate property. It was tangible evidence of the magazine’s [75 year] history and its place in the iconography of the West. It made Western Horseman more than just a magazine. Within the culture of that magazine’s readership, I can’t imagine that sense of loss ever going away." HMH: These days you seem to have several irons in the fire AJ, you’re the editor of Ranch and Reata, a contributing editor for The Cowboy Way, you recently completed a book collaboration with Buck Brannaman on Ranch Roping and you’ve launched a video magazine called The Frontier Project; are you busier now than when you were at WH? Happier? What’s next? What would you like to accomplish? AJ: "I’m absolutely buried in work at the moment. Behind my desk, I have a whiteboard listing no less than 15 active projects: issues of magazines, book ventures, documentary projects, my immediate goal is to get a grip on all of it and somehow make it through the year with my sanity intact. I’m especially proud of Ranch & Reata. It’s both a new approach to media; blending digital, print and broadcast, and a throwback to classic approaches to documentary journalism. We’re not big on gimmicks or magazine fads. We’re strictly about great writing, great photography, great subject matter and presenting an eclectic mix of interesting material each time out. We have on board an outstanding team of writers and photographers; what each does with a story is as interesting as the story itself. On the filmmaking front, with The Frontier Project, I want to add to the genre a legit short-subject documentary form that isn’t built around promotional videos or infomercials. There’s surprisingly little out there that fits the definition." HMH: Have you had a chance to see Buck’s new documentary film? If so what did you think of it? AJ: "I’m embarrassed to say I have yet to see it. I just haven’t been anywhere where I can access it. I’m encouraged though by the overwhelmingly positive reaction to it at Sundance and in major media outlets. Without exaggeration, I can say that if there’s an ideal ambassador for what western horsemanship is supposed to be about, and for what horses can do for people, it’s Buck. Whether you appreciate his horsemanship, his personal journey, his business success, he’s an impressive individual and one of the most inspiring people you can imagine being around. I’ve been fortunate to work with him on a couple of major projects. I always leave a visit with Buck feeling inspired to put forth his level of energy and commitment into my own work and to do so without compromising the ideals I believe in." HMH: How is your recent move going? You’re now calling Pueblo, Colorado, home. Has it been a healthy change? AJ: "Everything vital is unpacked. That leaves a lot of ‘stuff’ that’s still in boxes, in the way. I’m nearly finished fencing the new pastures but plenty of work on the property still remains undone. With publishing and film projects ongoing, it’ll be several weeks, maybe months, before we have a routine down. It’s been a healthy change. We moved to be closer to a new career opportunity for my wife. We were living in a fairly remote location in the ranch country east of Colorado Springs. We’re now in an equestrian community outside Pueblo. The locals here still consider this ‘country’, but it feels very suburban to us. The other day we actually had a pizza delivered. The move has been an overwhelming amount of work and it’s taught us that our next move, if there is one, will require much more time and planning." HMH: How are your horses doing? Do you have much time to ride? This is always a challenge isn’t it? We write about the horse industry but we often are so busy we don’t get to ride much ourselves! AJ: "The horses are good. We have two geriatric geldings in retirement, eating their weight in hay every day. Our other two horses are, like us, awaiting the arrival of a steady routine so we can get back to riding on a regular basis. That contradiction, immersing ourselves in the horse world as writers and ending up with little time to ride seems to affect everyone in this profession. When you have the inevitable bad day dealing with a particular horse-world personality, it can taint your personal time with horses to the point where riding is the last thing you want to do. I once had a nasty confrontation with the head of a saddle company who was demanding something I couldn’t ethically offer. When I got home from work that day, all I wanted to do was saddle up, ride and forget the day’s events. As I was tightening my cinch, it dawned on me that my saddle was made by that company. It felt like such an intrusion into my own time with my horses. I pulled off the saddle, listed it on eBay that night and headed up to Brighton Saddlery that weekend to find a new rig. In this field, we have to keep certain barriers between work and the rest of our lives. Otherwise, it’s just not healthy. It’s tough to do when our passions and our work overlap."